The nine keys hand-set in this sterling silver bracelet come from typewriters from the 1920s, '30s and '40s. 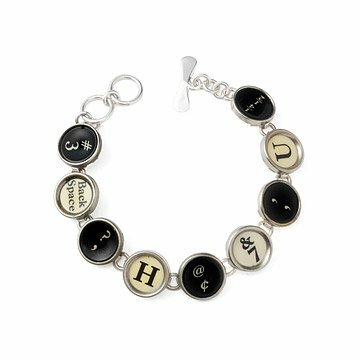 Handmade from the classic round keys of retired typewriters, this one-of-kind bracelet makes sure that you always have the write style. The nine elegant keys come from typewriters from the 1920s, 30s and 40s, and are handset into the sterling silver bracelet. Created by designer Ward Wallau. Handmade in the USA and Mexico. Gave as a gift, she loved it! My friend has been making typewriter earrings for gifts. I was so excited to find the bracelet in your catalog and give her a gift! Great gift for a writer, of course, and for antique buffs. The only reason I didn't give it five stars is that the clasp was not easily adjustable. For small wrists go for fewer typewriter keys (e.g. 7 instead of 9). I bought two of these. One for myself and one to give my sister for a Christmas gift. This was a gift to my great-niece who is young, stylish, and likes vintage, hand-made, good design details. She also likes the old manual typewriters. She was delighted with the bracelet, and with the packaging, and so was I. She put it on immediately, no problem, and it looked perfectly sized for her small wrist. This was a special gift for an elderly woman who typed a column on a manual typewriter for over 30 years (before learning to use a computer and telecommuting from the age of 90 to 95). She could not have been happier with this gift. I could not have been more pleased with the staff and service at UncommonGoods. Thank you! My wife really loved this bracelet. She liked the uniqueness of the bracelet and the fact that it was authentic typewriter keys. The clasp is easy to connect. The only distracter that she saw was that it is a little on the light weight side, she wished it had a little more weight to it, but otherwise she loves it and wears it regularly. Excellent customer service. Great nostalgic product, very comfortable to wear. Lots of compliments when wearing it. I love this simple unique bracelet!